Note: some objects require multiple techniques and may appear in multiple decorative technique categories. Glass decorated by using a cylindrical or truncated conical one-piece mold with a patterned interior. 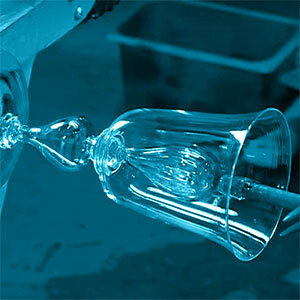 The mold produces a pattern of vertical ribs in the walls of a glass object. Glass decorated by using a cylindrical or truncated conical one-piece mold with a patterned interior. The mold produces a decoration that resembles the surface of a pineapple. Threads of glass that extend around a vessel. A trail, usually of a contrasting color, wrapped around the edge of the rim. It is also known as a lip wrap. Threads of glass that extend, beltlike, around the circumference of a vessel. A pair of closely spaced wraps that have been pincered together at intervals to create a chain-like appearance. 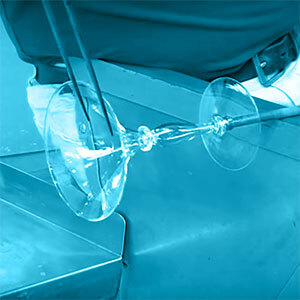 (Italian, “filigree glass”) The generic name for blown glass made with colorless, white, and sometimes colored canes. 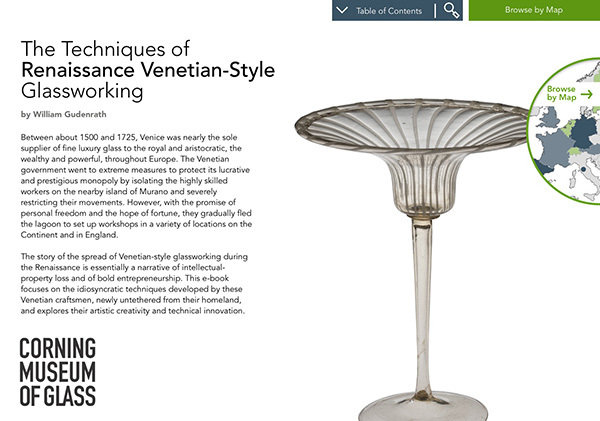 The filigrana style originated on the island of Murano in the 16th century and spread rapidly to other parts of Europe where façon de Venise glass was produced. 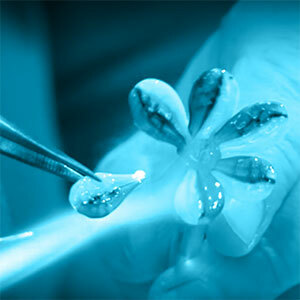 Manufacture on Murano continued until the 18th century, and it was revived in the 19th century. A technique which produces an appearance similar to traditional reticello without the bubble at the intersection of the canes. 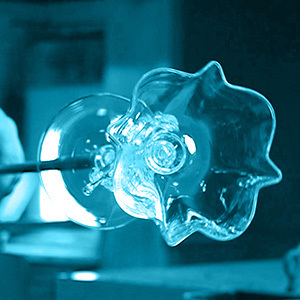 Inflating a parison of hot glass in a mold. The glass is forced against the inner surfaces of the mold and assumes its shape, together with any decoration that it bears. 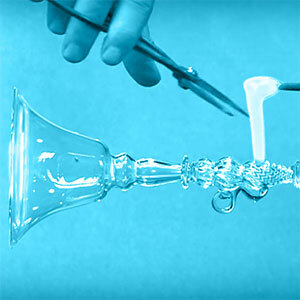 The process of decorating glass by the use of gold leaf, gold paint, or gold dust. 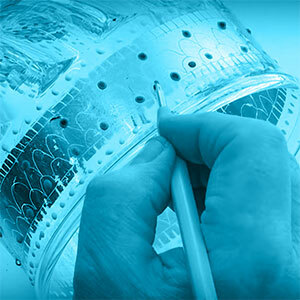 The gilding can be applied with size, or amalgamated with mercury. It is then usually attached to the glass by heat. 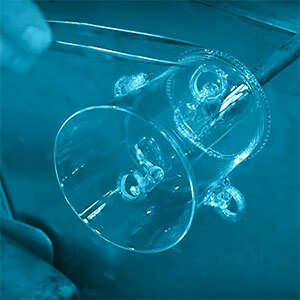 Gold leaf can be picked up on a gather of hot glass. Batch ingredients such as sand and alkali, which have been partly reacted by heating but not completely melted. After cooling, frit is ground to a powder and melted. 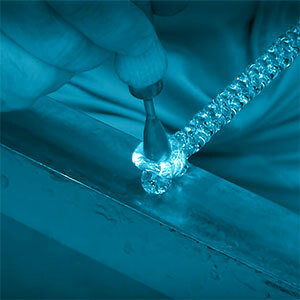 Fritting (or sintering) is the process of making frit. 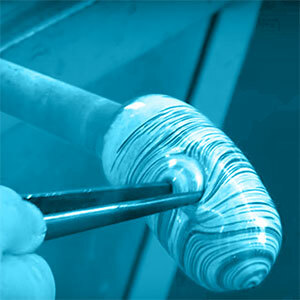 Decoration in which a spiral thread (wrap) of colored glass (usually white) is manipulated with a tool to create a festooned pattern on the surface of a vessel. A technique that creates a shape at the edge like a handkerchief floating downward after being tossed in the air. 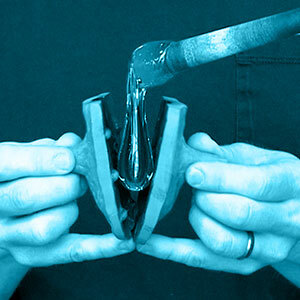 A shaping process in which a tool is used on both the inside and outside of a hot vessel to give it a wavy shape. Glass marbled with brown, blue, green, and yellow swirls in imitation of chalcedony and other banded semiprecious stones. Calcedonio was first made in Venice in the late 15th century. (German) A flask with the neck divided into two or more tubes. The Kuttrolf, which has Roman antecedents, was produced by German glassworkers in the later Middle Ages; it is also found among Venetian and façon de Venise glasses of the 16th and 17th centuries. 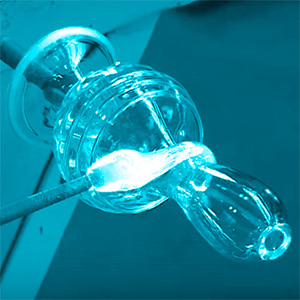 A bulb of colored glass (usually aqua) attached within the interior of a vessel. A decoration in which rings of glass are trapped (but not fixed) on the exterior of a vessel, using tiny strips of molten glass. 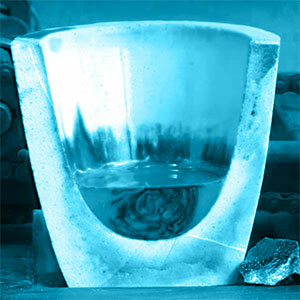 A decorative effect that causes the surface of the glass to resemble cracked ice. 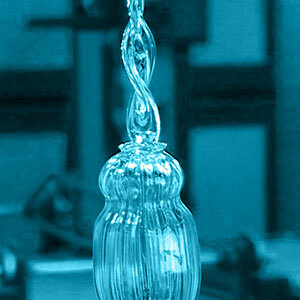 This is achieved by repeatedly plunging a parison of hot glass into cold water and withdrawing it quickly. 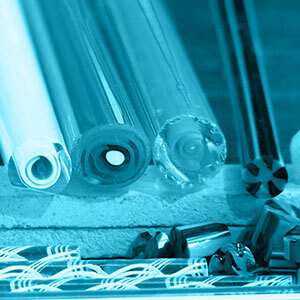 The thermal shock creates fissures in the surface, and these impart a frosted appearance after the parison has been reheated to allow the forming process to continue. 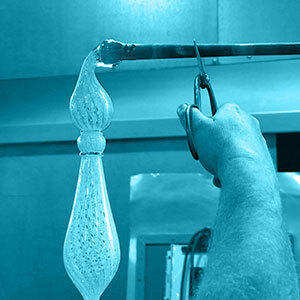 A decoration achieved by embedding in molten glass small slices of canes that have regular patterns of contrasting color. 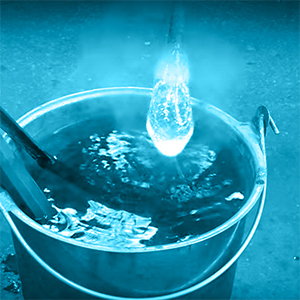 The technique of forming objects from rods and tubes of glass that, when heated in a flame, become soft and can be manipulated into the desired shape. Formerly, the source of the flame was an oil or paraffin lamp used in conjunction with foot-powered bellows; today, gas-fueled torches are used. 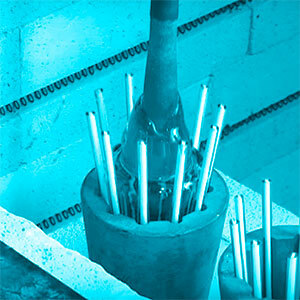 Structural additions (usually solid) added to vessels, usually at the end of the manufacture process, for either decoration or to allow one to hold the vessel more easily. 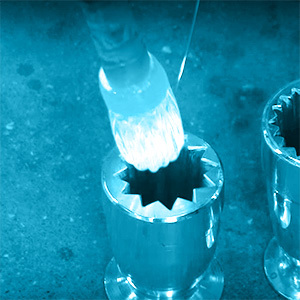 A tubular structure created at the surface of a vessel to allow one to pour from the vessel more easiliy. 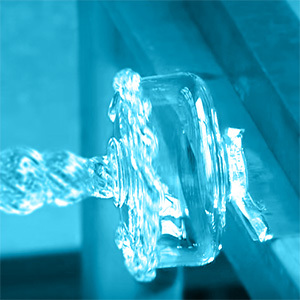 Tiny amounts of molten glass that are added atop another decorative element and then squeezed with a two-bladed tool to create a waffle-like pattern. Tiny amounts of molten glass that are added in the form of a line and then immediately manipulated with tweezers to create a denticulate pattern. 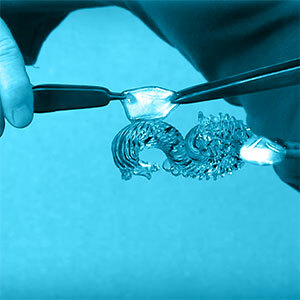 Tiny amounts of molten glass that are partially cut with shears to create feather-like edges. A blob of glass applied to a glass object primarily as decoration, but also to afford a firm grip in the absence of a handle. A flat, circular prunt with an impressed design resembling a raspberry.